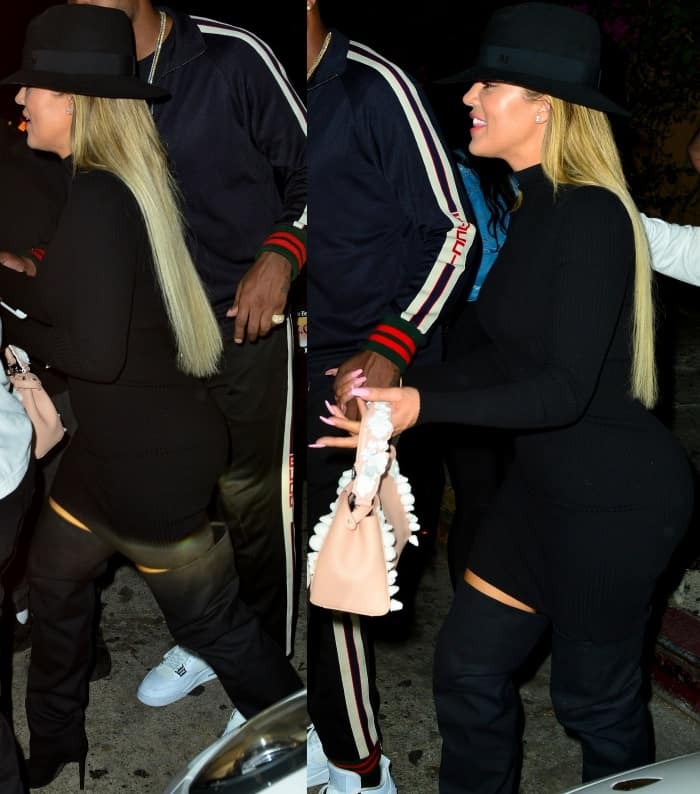 It looks like Khloe Kardashian and boyfriend Tristan Thompson enjoyed their night out at Lure Nightclub this past weekend in Los Angeles! The pair was spotted smiling and leaving the nightclub in good spirits — and good fashion. Tristan wore a navy Gucci shellsuit and white sneakers, while Khloe dressed in head-to-toe black. Khloe wore a black ribbed Naked Wardrobe dress with long sleeves and a high neck. The 32-year-old television personality styled it with Maison Michel’s “Virginie” fedora (available at Net-A-Porter), which features black rabbit felt and a tonal grosgrain ribbon. Khloe added a feminine splash of color to her look with the baby pink “Peekaboo” leather bag from Fendi, which features floral appliques and boasts of a hefty price tag ($4,250 at Net-A-Porter). The budding entrepreneur finished off her look with glossy pink lips, powder pink nails and black slouchy thigh-high boots. Khloe Kardashian leaving Lure Nightclub in Los Angeles, California, on July 7, 2017. Earlier this week, Khloe celebrated Independence Day by posting an Instagram photo in which she could be seen pushing an ice cream cart. In the pic, Khloe rocked a fuchsia one-piece swimsuit with a scoop neckline and a low back, which was tucked it into a pair of high-waist cut-off denim shorts from her Good American line (available at Nordstrom). Her denim shorts feature a five-pocket style, a gap-proof contoured waistband, side slits, frayed edges and shredded details. Khloe completed her Instagram-centric ensemble with Adidas “Adilette” slides, which you can get for $45 at Amazon. These slides feature synthetic uppers, a contoured footbed for maximum comfort and soft textile lining. In this set of photos, she looked fabulous in her Roberto Cavalli “Animalier” sequined tulle and lace dress ($2,372 at Luisaviaroma). It featured spaghetti straps, lace upper panels, all-over stitched sequins, and silk lining. Khloe styled the dress with tousled waves, an Atelier Swarovski clutch and Cartier “Love Yellow” diamonds. Tamara Mellon “Frontline” sandals provided the finishing touches to her fabulous birthday outfit. These sandals feature pieced nappa leather and transparent PVC floating straps. They also have covered heels, leather soles and center rear zip closures.